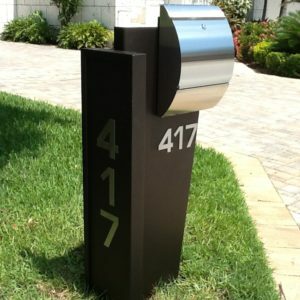 The Bowman is a modern curbside mailbox featuring an architectural multi-sided stand and stainless steel rectangular mailbox. 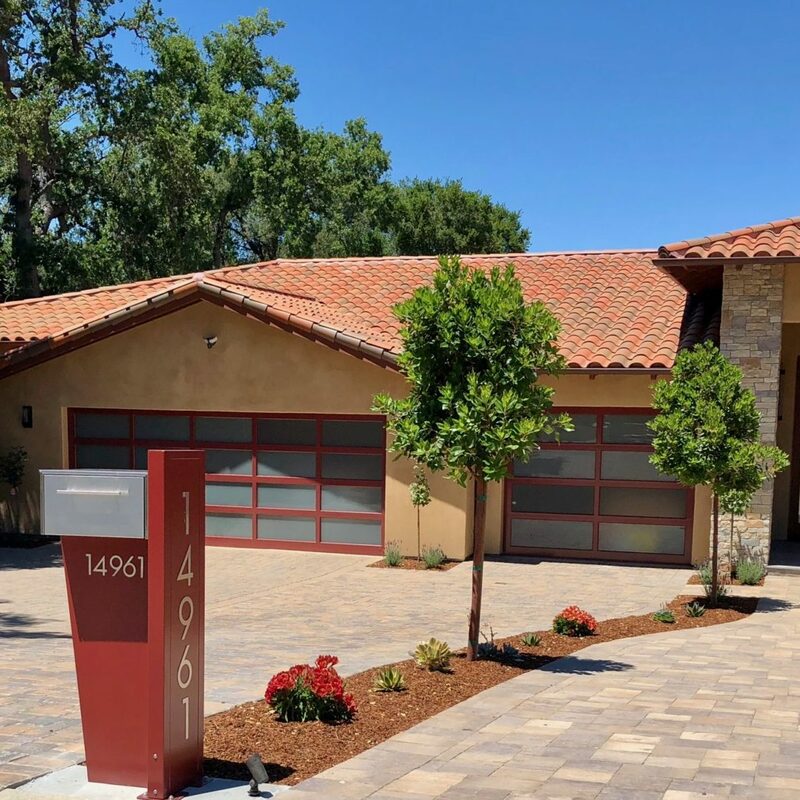 A variation of our tall Bowman curbside mailbox, this striking contemporary mailbox unit combines a powder coated aluminum stand with the Scottsdale mailbox. 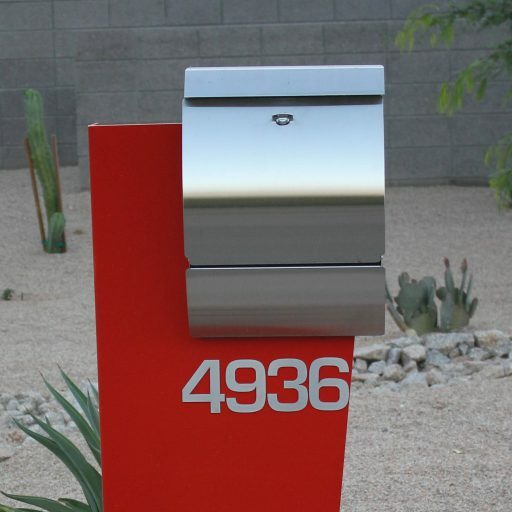 This contemporary curbside mailbox unit is composed of two stands which get attached to each other, the Scottsdale mailbox, and two sets of stainless steel address numbers. The first stand is 48” tall and extends up the side of the Scottsdale mailbox, while the second stand is single sheet of powder coated aluminum and is set perpendicular for the Scottsdale mailbox to sit on. With its eye-catching design and custom personalization options, the Bowman is the perfect addition to modern and contemporary homes. 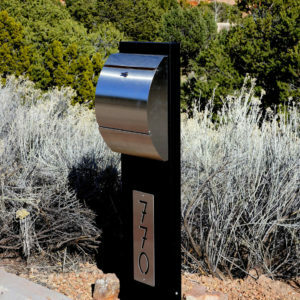 The Bowman is a modern curbside mailbox featuring an architectural multi-sided aluminum stand and stainless steel rectangular mailbox. 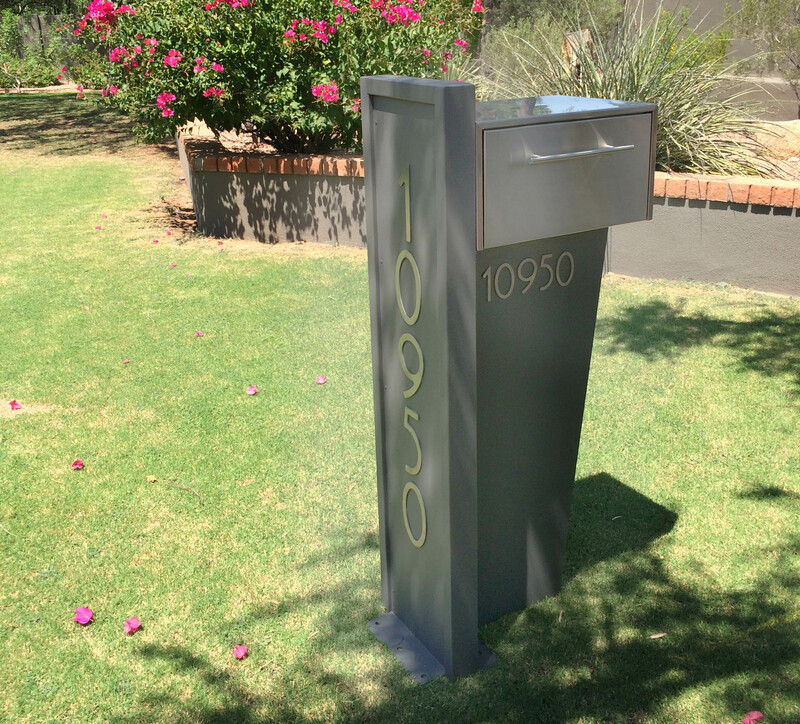 A variation of our tall Bowman curbside mailbox, this striking modern mailbox unit combines a powder coated aluminum stand with the Scottsdale mailbox. This custom unit is available with the mailbox on the left or right in your choice of color and comes with 2 sets of stainless steel address numbers (3” horizontally under the mailbox, 6” vertically on the side stand). It is designed to be bolted to a concrete pad. Please call to order this unit. Shipping cannot be calculated online. Design your perfect modern curbside mailbox with our wide variety of options. As always, made in the USA! Our mailboxes are made from high grade 304 stainless steel to ensure they last and look beautiful for years to come. We offer custom and semi-custom mailbox designs with a choice of colors, address numbers or plaques, locking options, and LED lights. We are a family run company. 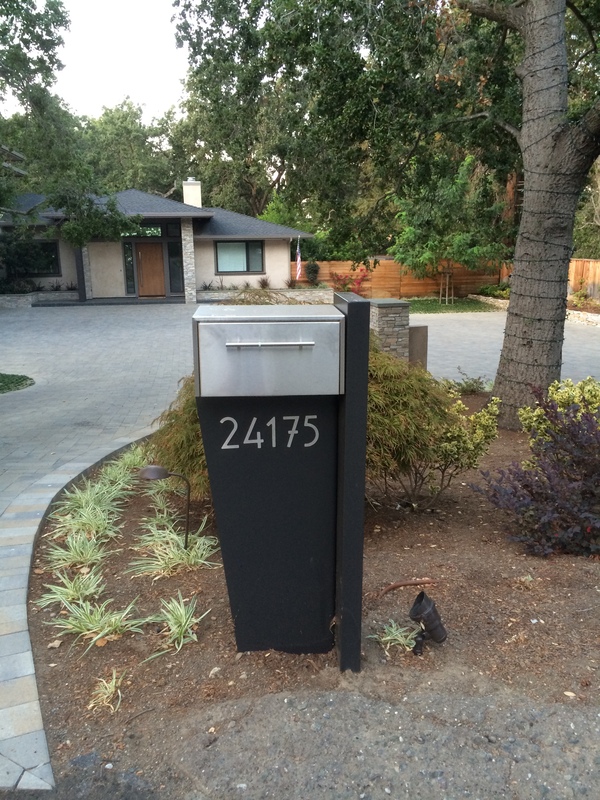 We work directly with you to build your dream modern curbside mailbox that will turn heads.